Maurizio Cattelan came out of his self-imposed, five-year retirement from the art world just in time. His work has always been prescient, sometimes uncannily so. His life-like wax portrait of Pope Paul II in full papal regalia lying inert under a felled meteorite—La Nona Ora (The Ninth Hour) (1999)—presaged the sexual abuse scandals of the Catholic Church. AC Forniture Sud (Southern Suppliers FC [Football Club]), a performative piece from 1991 in which the artist organized an Italian soccer team exclusively comprising North African immigrants, coincided with the establishment of a xenophobic political party in Italy. What Cattelan couldn’t have predicted was the unprecedented number refugees that would land on Italian shores seeking asylum, or the rising tide of hatred and fear now sweeping Europe in response. Cattelan’s 2007 sculpture, Ave Maria, is also shockingly anticipatory. The work is composed of three white male arms protruding at an angle from a gallery wall, their precise positions and overt repetition unmistakably evoking the intense choreography of the “Heil Hitler” salute (despite the religious inflection of the title). The fact that the appendages are wearing business attire—a sign, perhaps, of the unabated rise of corporate power—frighteningly suggests today’s normalization of neo-Nazi ideology here and abroad. 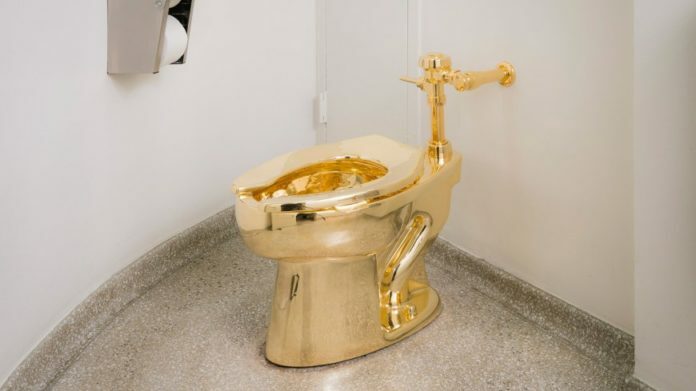 Enter Cattelan’s “America” (2016), the 18-karat gold, fully functioning toilet that was installed at the Guggenheim for nearly a year in a long-term, sculptural performance of interactive art. Like all of Cattelan’s most complex works, this sculpture is laden with possible meanings. There is the art-historical trajectory, from Duchamp and Manzoni to more contemporary artists like John Miller and Wim Delvoye, that traffics in scatological iconography. The equation between excrement and art has long been mined by neo-Marxist thinkers who question the relationship between labor and value. Expanding upon this economic perspective, there is also the ever-increasing divide in our country between the wealthy and the poor that threatens the very stability of our culture. Cattelan explicitly comments on this fact by creating what he called “one-percent art for the ninety-nine percent.” The gold toilet—a cipher for the excesses of affluence—was available for all to use in the privacy of one of the Guggenheim’s single-stall, gender-neutral bathrooms. More than one hundred thousand people waited patiently in line for the opportunity to commune with art and with nature. Yet it was the Trump reference that resonated so loudly during the sculpture’s time at the Guggenheim. When the artist proposed the sculpture in mid-2015, Donald Trump had just announced his bid for the presidency. It was inconceivable at the time that this business mogul, he of the eponymous gilded tower, could actually win the White House. When the sculpture came off view on September 15, Trump had been in office for 238 days, a term marked by scandal and defined by the deliberate rollback of countless civil liberties, in addition to climate-change denial that puts our planet in peril. That Trump is synonymous with golden toilets was proven not at the Guggenheim but in a recent satirical pop-up “exhibition” in midtown Manhattan staged by Trevor Noah of the Daily Show that he called the “Donald J. Trump Presidential Twitter Library.” In addition to framed tweet storms, visitors were treated to a “tour” of the Oval Office, where they could don a Trump wig and pose with an, albeit fake, golden toilet. Cattelan’s “America,” like all his greatest work, is at once humorous and searing in its critique of our current realities. Though crafted from millions of dollars’ worth of gold, the sculpture is actually a great leveler. As Cattelan has said, “Whatever you eat, a two-hundred-dollar lunch or a two-dollar hot dog, the results are the same, toilet-wise.” Art-wise, the work reached a certain pinnacle of acceptability—or notoriety—when it was featured on the cover of the New York Post (September 15, 2016) with the headline, “We’re #1 (and #2! ),” and an article titled, “The Guggenheim Wants You to Crap All Over ‘America.’ ” However, Cattelan’s anticipation of Trump’s America will, perhaps, be the lasting imprint of the sculpture’s time at the Guggenheim.